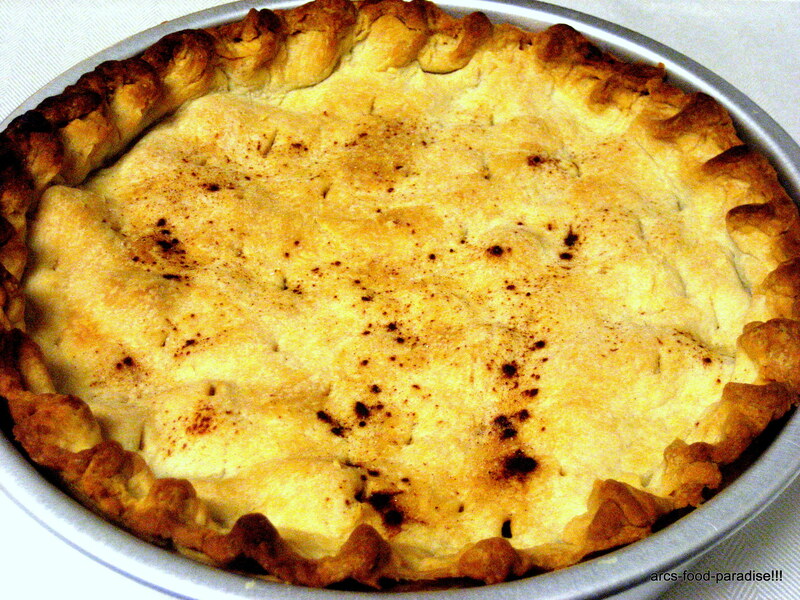 Apple Pie | The Flavor Nook! 1. In a wide mixing bowl, take all-purpose flour/maida. Beat an egg into it. Then, add a cup of vegetable shortening and thoroughly mix the flour. Add some water, and knead the flour into a nice dough and place it in the refrigerator for about 15 mins. 2. Peel the skin off the apples, cut them into small pieces and take it in a separate bowl. To this, add a cup of sugar, 2 tsps of cinnamon powder and mix it well so that all the apple pieces are coated with the sugar and cinnamon. 3. Remove the dough from the refrigerator and using a rolling pin, make 2 equal size and thick rotis. 4. Ready the cake pan, or a pie pan by applying some oil/butter to the inside of the pan and then sprinkle some flour on it. 5. Place one roti/dough in the pan and press it to the inside of the pan. Make sure you leave atleast an inch of the dough out of the pan. 6. Place the apple mixture in the pan now over the dough. Spread it evenly. Now, place the other dough over the apples and press the left over inch of inner and outer dough together. 7. Sprinkle a tsp each of cinnamon powder and sugar over the dough. 8. Heat the oven to 375F-400F and bake for about 30-35 mins. 9. Once done, remove the pie from the oven and let it cool for at-least 10 mins and then serve it hot or cold plain or with some cool whip.